Had there not been a Tom Mix, Hollywood would surely have invented one, and the truth is that Hollywood, for the most part, did. The actor whose screen image so defined and romanticized the American concept of cowboy never even saw the West until his mid-twenties, nor was he half the legend Hollywood proclaimed him to be. But he had a gift for showmanship, a striking presence, and always looked at home on the range. As the sharp-witted journalist and screenwriter Adela Rogers St. John observed, "He was as elegant on a horse as Fred Astaire on a dance floor, and that's the elegantist there is." Born in 1880 in his father's family's home town of Mix Run, not far from Driftwood in central Pennsylvania's Cameron County, Thomas Hezekiah Mix was the third of Edwin and Mary Mix's four children. Edwin Mix was an accomplished horseman. He managed stables and trained and drove horses for a living, and when the family moved some thirty miles southwest to Dubois in 1888, he started the long process of teaching his second son as much as he could about horsemanship. The apprenticeship continued well into Tom's teens, far longer than Tom's formal education, which ended when he finished grade school. Tom Mix getting ready to take on the bad guys in The Untamed , 1920. At the outbreak of the Spanish-American War, Mix, then eighteen, enlisted in the army. By the time he - and a herd of movie publicists - had fine-tuned his biography years later, Mix was a bonafide war hero. He had ridden up San Juan Hill with Teddy Roosevelt, fought for the English in the Boer War, and helped quell the Boxer Rebellion in China. In his spare time, he had also graduated from the Virginia Military Institute, served as a sheriff in Kansas, and even joined the Texas Rangers. The truth? He had done none of that. What he did do was desert the army, marry the first of his four wives, and escape his past in the time-honored American tradition of heading west and reinventing himself. Settling in as a ranch hand in Oklahoma, he found the leg up to his future. The ranch owners also ran a popular Wild West touring show, and from 1906-1909, Mix, with his superb horse sense and skills, grew into a featured performer, wooing - and wowing - crowds with his daredevil riding and his outsized personality. In 1909, he jumped to a second Wild West show, and then briefly formed his own with his second wife, before jumping, in 1910, to still another. That same year The Selig Company, a silent movie producer, corralled him to help find cowboy extras and suitable locations for shooting westerns in Oklahoma. When they saw him ride, they promoted him to a stunt double. When they saw him on film, they promoted him to featured performer. In time, audiences promoted him to a box-office star. By 1914, Mix had graduated from acting in short films to longer features - with few exceptions, all Westerns - many of which he also wrote, produced and directed. In 1917 he then signed a contract with Fox Studios. One of Fox's biggest draws, he earned upwards of $20,000 a week, and through movies like The Heart of Texas Ryan, Sky High, and Riders of the Purple Sage, remained one of Hollywood's most bankable and beloved idols of the silent era. All told, he made more than 350 films. Still, it wasn't the quantity of his output that was so remarkable. It was his vision. Though the Western was nothing new to the movies - the "oater" became cinematic staple with Edwin S. Porter's The Great Train Robbery in 1903 - Mix brought something new to the genre: lightness. By contrast, the other major cowboy star of the era, William S. Hart, was cut from a darker, dourer cloth; he insisted on realistically depicting the humbler, plainer, less flamboyant west he was raised in. Mix, the easterner who grew up transfixed by the dime-novel sensations of the west, bore no such burden. And so his was a west of ten-gallon hats and white satin suits, where good always triumphed and a man's horse - Mix's Tony was the screen's first animal star - was his best friend. It was a theatrical west of legend and fantasy with himself in its center, full of brio, larger than life, and clearly enjoying himself. He had the formula down cold. "I ride into a place owning my own horse, saddle and bridle," Mix explained. "It isn't my quarrel, but I get into trouble doing the right thing for somebody else. Poster for the National Tom Mix Festival held in DuBois, PA., October, 1980. When it's all ironed out, I never get any money reward. I may be made foreman of the ranch, and I get the girl, but there is never a fervid love scene." 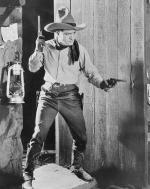 Mix's west was immensely popular with movie-goers, especially younger audiences, and it segued seamlessly into the West such later icons as John Wayne, Gary Cooper, and Jimmy Stewart would ride into. Off-screen, Mix embraced his stardom - and his image. He was famed for throwing lavish parties, arriving at others" parties in full western regalia, and amassing an enormous collection of cowboy boots and hats. Though he retired from the movies at the end of the silent era - he would return intermittently until 1935 - rather than put his persona away, he took it on the road. He headlined in vaudeville and traveling circuses, including his own Tom Mix Circus, which toured the country from 1936-38. He died in an automobile crash near Florence, Arizona, in 1940. But his personality wasn't ready to die with him. 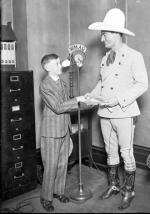 "The Tom Mix Show," with actors voicing the Mix role, aired on radio through the 1940s. He thrived as the hero of a comic book series. In the 1950s, The Tom Mix Show galloped onto television, resurrecting old Mix movies for a new generation. Mix was inducted into the National Cowboy Hall of Fame in 1958. Sadly, the vast majority of his films burned in a studio fire. Robert S. Birchard, King Cowboy: Tom Mix and the Movies (Burbank, CA: Riverwood Press), 1993. 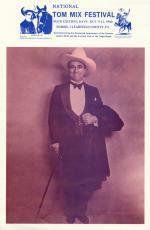 Paul E. Mix, Tom Mix: A Heavily Illustrated Biography of the Western Star (Jefferson, N.C.: McFarland and Co.,), 1995.